This PCIe host card ist based on Tehuti's new 3rd generation TN4010 controller and optimized 10 Gigabit Ethernet MAC designed for low-power, low-cost, single-port connectivity required by Application Servers and Workstations. The TN4010 MAC is paired with the AQRate® AQR105 transceiver, a low-power, high-performance NBASE-T PHY. 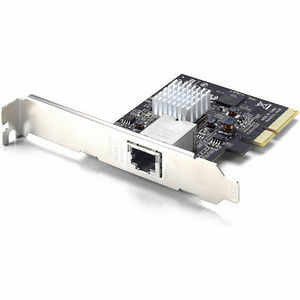 This card supports auto-negotiation allowing the NBASE-T solution to optimally select the best speed: 10 Gigabit Ethernet (10GbE), 5 Gigabit Ethernet (5GbE), 2.5 Gigabit Ethernet (2.5GbE), 1 Gigabit Ethernet (GbE) or 100 Megabit Ethernet (100MbE) over Cat5e/Cat6 or better cabling.